Panthers supremo Ged Rathbone has urged his riders to keep their cool as they enter a Premier League play-off cauldron tonight (September 17). The city racers travel to Owlerton Stadium (7.30pm) to take on Sheffield in the first leg of what has already become a quarter-final grudge match. It is sure to be a fierce battle on the super-fast South Yorkshire track following a bitter row between the clubs over the staging of the contest. Rathbone refused to agree to race tonight due to the unavailability of three riders – Ben Barker, Anders Thomsen and Emil Grondal – ahead of major weekend meetings in the Czech Republic. The fact those riders have since declared themselves available for battle after the club were ordered to fulfil the fixture by the British Speedway Promoters’ Association (BSPA) has done little to appease his anger. Rathbone said: “To say I’m furious is an under-statement. I thought it took the agreement of two promoters for a meeting to be staged, but in this case we have been dictated to. “We repeatedly said that we could not race tonight, but the Sheffield promotion have refused to budge and we have been forced into it. “We have riders who have equipment which is due to be serviced following the completion of the regular season last weekend and that just hasn’t been possible. “We also have other guys competing in big, big meetings on the continent this weekend who have had their travel plans messed around. “These are not Grand Prix riders with the luxury of bikes and mechanics in several different countries. Getting to the Czech Republic is far from easy and it has been made a whole lot harder for them now. “We are very thankful to them for agreeing to help our challenge for honours, but I remain adamant they should not even have been put in this position. “I fully appreciate that Sheffield are a Thursday track, but I do not understand the urgency in getting this meeting staged – especially as the other quarter-final involving Glasgow and Plymouth is not even scheduled yet. “There is no doubt in my mind it is damaging the credibility of the play-offs to be forced to ride in a meeting of such magnitude in these circumstances. “We have been dealt some terrible cards during this season with a succession of serious injuries. Now this is another one we will have to overcome. “We will make the best of the situation we can by going there with the right attitude and doing everything in our power to win the meeting. Simon Lambert stands in as skipper for Panthers’ play-off bid with regular captain Ulrich Ostergaard ruled out for the rest of 2015 by a broken foot. He underwent surgery in his native Denmark at the weekend. Lambert is therefore the only surviving member of the septet initially put together by Panthers bosses last winter. 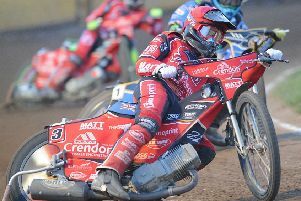 Danish ace Michael Palm Toft did arrive ahead of the start of the club’s competitive fixtures although he was a replacement for Adam Roynon, who suffered serious injuries in the opening race of the season at the East of England Showground. The club have also lost Olly Allen to injury, seen Lewis Blackbird retire and dropped Robert Lambert and Ollie Greenwood. Panthers are hopeful of securing agreement from Sheffield to stage the second leg at the East of England Showground on Sunday, September 27. SHEFFIELD: Jason Garrity, Josh Bates, David Bellego, Nicolai Klindt, Andre Compton, Paco Castagna, Robin Aspegren. PANTHERS: Rider replacement for Ulrich Ostergaard, Simon Lambert, Anders Thomsen, Michael Palm-Toft, Ben Barker, Rafal Konopka, Emil Grondal.